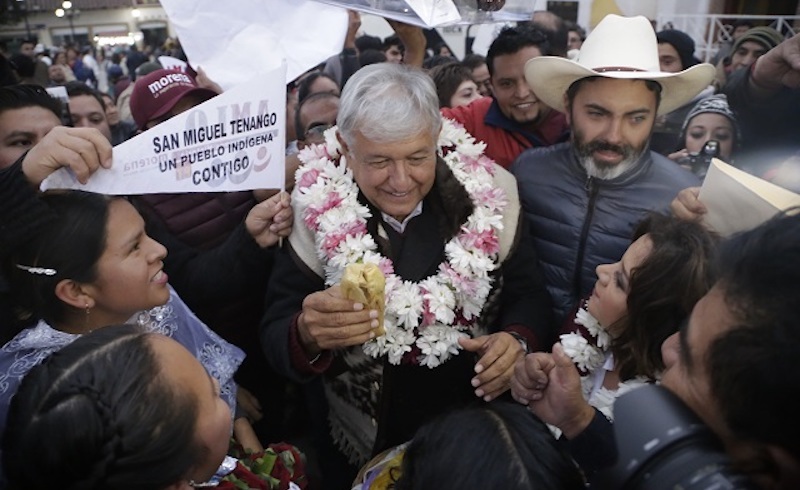 Christy Thornton reports from Mexico on Andrés Manuel López Obrador's victory in Sunday's election and reflects on the forces lined up to oppose his agenda. López Obrador campaigns in Puebla, February 2018. When the polls closed on Sunday night, giving an overwhelming victory to leftist Andrés Manuel López Obrador, I was in a remote, rural area of the State of Mexico. We had spent the day driving along the rutted, half-paved roads, visiting polling stations installed in primary schools and bus stations and tin-roofed football fields. That morning, many polls had opened more than an hour late, owing to the complexity of the elections — more than 3,400 positions were in contest, from the presidency and the entire national legislature down to local municipal councils. People stood in long lines, grumbling as the sun beat down with increasing strength. Some voters had come from early morning mass, but many more arrived to try to vote before setting off for a day working in the area’s fields and factories. Dotting the landscape of cornfields and pastures where sheep and cows graze are important industrial installations — a maquila for Latin America’s largest tool manufacturer, for instance, is a key employer in the area. Even on a Sunday, many voters told us, they didn’t have time to wait for the delayed polls. They needed to get to work. The State of Mexico is the country’s most populous, and is a traditional stronghold of the Institutional Revolutionary Party (PRI), which ran Mexico unopposed for more than 70 years. The area we toured has a long history of PRI support — the shadowy group of insiders who control the party structure is called the Grupo Atlacamulco, named for a municipality nearby. At the helm of the Grupo is a powerful political dynasty, the del Mazo clan; the current governor, Alfredo del Mazo, whose father and grandfather also both served as governor, is a cousin of the current president, Enrique Peña Nieto. As we walked the streets of the municipal center, we saw walls plastered with the PRI’s election propaganda, including a campaign mural that read, “I remember when Jilotepec was safe!” — nostalgia for the security of the single-party state. But support for the party has been rapidly eroding, even here, in the state known as the “cradle of the PRI.” In last year’s gubernatorial elections, del Mazo won with just over 34% of the vote, as compared with the 65% won by his PRI predecessor. The challenger, Delfina Gómez, was a political newcomer, a teacher with little previous experience running on the ticket of a brand new party: López Obrador’s Movement for National Regeneration, or Morena. When the polling showed Delfina, as her supporters call her, running a surprisingly strong race, the PRI machine pulled out all the stops to prevent her from winning. Observing that election last year, I witnessed vote buying, coercion, intimidation, and violence. Facing the PRI’s well-oiled corruption machine, she lost by less than 3 percent. In retrospect, del Mazo’s win last year appears as a last gasp of a dying party. On Sunday night, when the boxes were emptied and the colorful paper ballots began to be separated, by hand, into unwieldy stacks, the result was obvious. The local electoral official, on his knees for more than two hours on the hard tile floor of a primary school classroom, struggled to keep the Morena stack from spilling over. It was clear that in our small corner of Mexico, Andrés Manuel López Obrador, and Morena representatives down the ballot, had won in a landslide. We soon learned that this had been repeated all over the country — Morena won not just the presidency, but majorities in both houses of the legislature, and took the governorships in six of nine contests. The PRI’s presidential candidate, José Antonio Meade, on the other hand, failed to win a single federal electoral district. The elections were not without problems: pre-election violence was rampant; there was widespread distribution of money and other rewards in exchange for votes; and ballots were stolen and voters threatened. But the level of electoral fraud that has long been endemic to the Mexican political system — honed by the PRI during decades of one-party rule, and taken up by the opposition parties — was not enough to change the outcome of the election. The result was so overwhelming that the other presidential candidates took the unprecedented step of conceding immediately, before official results will be announced on Thursday. That the PRI lost so decisively marks a real turning point in Mexican democracy. Until 2000, the party and the state were largely synonymous, and for that reason the party was the organizing principle in Mexican politics. When voters returned the PRI to the presidency in 2012, after 12 years of rule by the center-right National Action Party (PAN), concerns about security and the economy were paramount. Those who voted for Peña Nieto hoped for a return to stability, and bet on a deepening of the neoliberalization that has marked Mexico in recent decades. But under Peña Nieto, violence has surged, the economy has stagnated, and corruption has dominated the headlines. What’s more, the three establishment parties — the PRI, PAN, and the center-left Party for the Democratic Revolution, or PRD — entered into a legislative coalition called the “Pact for Mexico” to push Peña Nieto’s agenda. With all three parties working together to cement the status quo, Mexicans seemingly had few electoral options for change. In this context, some viewed the creation of Morena in 2012 with skepticism, regarding it as little more than a vanity platform for López Obrador himself. But Morena was granted party status in 2014. After repeated political and economic crises brought hundreds of thousands of Mexicans out into the streets to protest impunity and economic mismanagement, the party began to gain more legitimacy. With scandal after scandal wracking the PRI government, and with violence surging, voters increasingly signaled their support for López Obrador’s platform. In such a situation, Morena’s triumph is all the more remarkable, because it signals that, despite the many failures of Mexico’s “democratic opening” since 2000, Mexicans still have faith that their political system can be changed. To be sure, achieving that change will be difficult, even with majorities in the legislature. Many of the neoliberal reforms pushed through by the Pact for Mexico, for example, have been cemented in the constitution. And during the campaign, López Obrador welcomed many strange bedfellows into his coalition, including former adversaries in the business class and the small right-wing evangelical party, Ecuentro Social. Leftists within Morena and in social movements outside the party structure will have to mobilize to ensure that these influences aren’t strong enough to prevent the kind of change that voters have overwhelmingly endorsed. What’s more, the structural conditions in which López Obrador will take power are daunting: Mexico’s openness to the global economy, the country’s relation with the United States, and the violent fracturing of power within the drug cartels all pose serious obstacles to change. But in each of these areas, López Obrador has proposed important policies. Offering more support to Mexican farmers, for example, to increase food security within the country, will be an important aspect of his administration’s approach to the NAFTA negotiations. He has also proposed policies that would effectively end Mexico’s role as a proxy for U.S. migration policy. Since the Obama administration, Mexico has militarized its southern border with Guatemala at the behest of the United States, trying to prevent migrants from Central America from crossing into Mexico. López Obrador has indicated that in his administration, Mexico will no longer do the United States’ “dirty work,” and that he will respect the rights of migrants. With regard to the drug cartels, López Obrador has introduced the idea of amnesty for low-level, non-violent cartel members, and he wants to provide scholarships for young people to keep them out of the drug trade in the first place. He has also indicated that he will turn away from the failed policy of deploying military units in the fight against the cartels, which has only produced the staggering levels of violence Mexico lives through today. Each of these policies will represent important changes from status quo. They will require not only challenging domestic structures of power, licit and illicit, but taking on entrenched interests in the United States, as well. Powerful lobbies for the agricultural and defense industries, which have benefitted so much from economic policies like NAFTA and security policies like the Mérida Initiative, are sure to oppose the changes López Obrador has proposed. As a renewed socialist left gains energy in the United States, it will be crucial to keep these international issues front and center in our struggles, in solidarity with the work that will also be so necessary within Mexico. Standing with the millions of Mexicans who have fought for change, activists in the United States will need continue to draw the connections between ending mass incarceration at home and ending the drug war abroad. After the results were announced late Sunday night, as thousands of people poured into the main square in Mexico City to receive López Obrador and celebrate his victory, I was traveling home in a car through the industrial suburbs north of Mexico City, listening on the radio to López Obrador’s victory speech and the chants of his supporters. I was reminded of the jubilation that met Barack Obama’s election in 2008 — the feeling that an important barrier to the full practice of democracy in our country had finally been broken. We learned, over the next eight years, just how easily feelings of hope and change could be betrayed, as well as how intensely the forces of reaction would fight for the status quo. As Mexico now looks with hope, toward change, it’s clear how hard the fight ahead will be — but it’s also clear that a majority of Mexicans are ready to take it on. Christy Thornton is an assistant professor of sociology and Latin American studies at Johns Hopkins University. Over the last week, she has served as an international election observer with the Red Universitaria y Ciudadana por la Democracia in Mexico.